Tom Monte has written an inspiring guide for those who suffer from chronic or life-threatening health conditions. Unexpected Recoveries is the culmination of a lifetime of work and has been designed to offer hope, purpose and most importantly-a proactive plan. This book combines modern medical know-how, ancient healing practices, and a healing diet to provide a comprehensive and practical guidebook for physical, emotional, and spiritual recovery. It takes aim at such conditions as cancer, heart disease, kidney disease, chronic pain, Crohn's disease, degenerative bone conditions, and more. 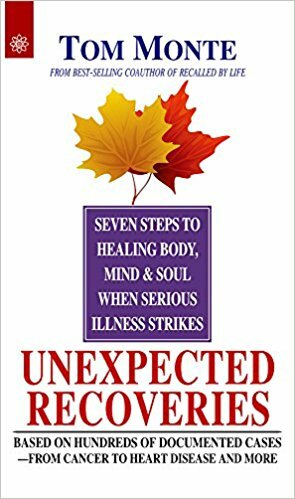 Readers are provided with a common-sense seven-step program to help them successfully complete the journey of healing. Factors such as mental attitude, lifestyle, diet, and exercise are discussed in an informative and easy-to-read manner. Along the way, readers are introduced to a number of people who recovered from illnesses that seemed incurable. A helpful resource section, a weekly menu planner, and over fifty kitchen-tested recipes are also included. When a doctor tells a patient there is no cure, what that doctor is essentially saying is that no standard treatment has yet been able to eliminate the condition. This doesn't mean healing isn't possible. If you or a loved one is dealing with a severe illness, Unexpected Recoveries can be a powerful tool to help change the course of the condition.